According to Todd Starnes at Fox News, soldiers at Fort Wainwright in Alaska were told to hand in their rifle scopes because a vendor put Bible verses on them. The verses (“JN8:12” and “2COR4:6”) supposedly appeared at the end of the scopes’ serial numbers and referenced passages from the books of John and Corinthians. The army is now using rotary tools to remove the “offensive language” from the killing tools so none of our snipers get offended while using them. 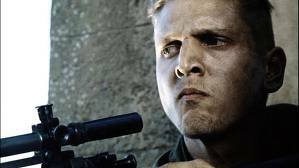 The only thing I know about snipers is what I learned from the acclaimed documentary Saving Private Ryan, and I thought it was pretty bad-assed the way Private Jackson said a little prayer before killing all those NAZIs. I have to assume all snipers are like that, right. The army shouldn’t prohibit this practice; they should encourage it. They should make up a little handbook with quotes from all the great religious books so snipers could say something cool before dropping the hammer on someone. Otherwise, what’s the point of holding the power of life and death in your hand if you’re not going to get all Biblical about it?